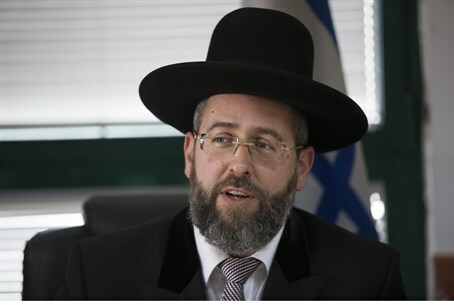 A proposal by the Attorney General could cause grievous damage to kosher consumers, Ashkenazic Chief Rabbi David Lau said. The Attorney General said Wednesday that it was possible for a food establishment to present itself as “kosher,” even if the supervising agent was not recognized by the Rabbinate, as had been the understanding of the law on kashrut fraud for the past 67 years of the State's existence. In a letter, Yehuda Weinstein wrote that if two restaurants who were demanding the right to call themselves “kosher” even though the Rabbinate refused to grant them a certificate of Kashrut. The two Jerusalem restaurants are suing the State in the High Court for the right to call themselves kosher, despite the fact that their certificates were rescinded – and the Rabbinate has fined them, with the restaurants demanding that the fines be rescinded. The restaurants say that the Rabbinate's demands are “excessive,” including demanding that they use only “bug-free Gush Katif” leafy vegetables. They are prepared to allow supervision, but not at the level demanded by the Rabbinate they told the court, which has asked the State to respond to the claims.